The United States Agency for International Development became the first agency to receive an A on the Federal Information Technology Acquisition Reform Act scorecard on June 13. However, the scorecard reveals an overall decline in agencies’ performances. FITARA, an act written by Rep. Gerry Connolly, D-Va., and his colleague Rep. Darrell Issa, R-Calif., is meant to streamline the IT acquisitions process and properly use the $80 billion the government spends on IT. The new scorecard reveals that USAID’s improvement curve has been steep; its overall scores on the past three scorecards were all Ds. 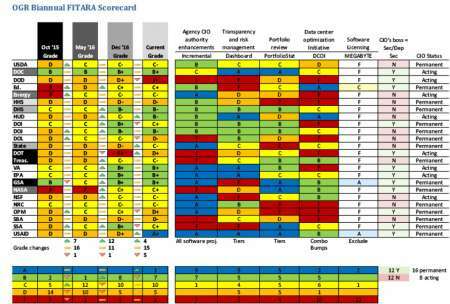 Congress monitors how well 24 agencies enact FITARA mandates through the biannual scorecard, which measures agency performance across four categories, including Incremental Development, Risk Assessment Transparency, IT Portfolio Review Savings, and Data Center Consolidation. Agencies are also given a letter reflecting their overall grade. USAID received As for enhancing CIO authority (incremental development), transparency and risk management, and portfolio review, successes that contributed to their overall A.
USAID cracking the glass ceiling of an A score is one of the only positive metrics reflected on the newest scorecard. On the whole, agencies’ grades declined this time around. One agency—the department of Defense—received an F as its overall grade. Four agencies’ overall grades went up, 15 remained the same, and five went down. Seven agencies received a B, 10 received a C, and 5 received a D.
These scores mark a departure from the last scorecard, which was issued Dec. 6 and showed overall improvement for most agencies. On the December scorecard, 12 agencies’ overall grades went up, 11 remained the same, and one went down. The December scorecard also included a new column in addition to the four original grading categories. Congress added a column denoting, with a plus or minus mark, whether CIOs reported to their agency’s secretary or deputy secretary. This column appears once more on the scorecard, and is flanked by two new categories monitoring Software Licensing and indicating CIO Status of an agency. All but three agencies—the department of Education, the General Services Administration, and USAID—received an F on their software licensing grade.